One of the Isle of Sheppey’s most iconic buildings, the award-winning Royal Hotel, Sheerness, is to be given a refurbishment costing more than £100,000 by brewers Shepherd Neame. It is the brewery’s second major recent investment on the island following the successful £350,000 relaunch of The Aviator, Queenborough, and Shepherd Neame is seeking a new licensee to run the business. 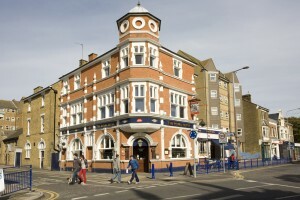 The Royal Hotel, in The Broadway, is a traditional town centre pub and hotel, which has been a major landmark in the heart of Sheerness for nearly 200 years. It was built in 1825 by Sir Edward Banks, who also designed Sheppey Dockyard and Southwark and Waterloo Bridges. The venue continues to be popular with both locals and visitors alike and has twice been voted Sheppey Pub of the Year. The pub is a thriving centre of the community with pool and darts teams, Sky TV, a function room, split level dining areas and 13 letting bedrooms. The building will be updated with contemporary décor and facilities while highlighting its traditional architectural features, such as the bar counter and back bar. The function room and bar will be redecorated and fitted with new flooring and furniture while a specialist lighting and sound system will enable the mood to be changed between daytime and evening. A new glass entrance lobby will be created and new toilet facilities with additional capacity are included, with provision for disabled customers. Shepherd Neame’s tenanted operations manager Greg Wallis said: “We would be delighted to receive applications from ambitious people with a flair for hospitality who can have some input into the refurbishment plans. This is a significant investment in the Sheerness economy and a great opportunity to run a business in one of the town’s most high-profile, iconic buildings.